Extant rollers have an Old World distribution and include the Coraciidae (true rollers) and the more terrestrial, long-legged Madagascan Brachypteraciidae (ground rollers). They are characterized by very long postorbital processes of the skull. The minor metacarpal of the carpometacarpus further bears a pointed projection on the ventral side of its proximal end, and the distal interosseous canal (canalis interosseus dis-talis) of the tarsometatarsus is plantarly open, so there is a marked furrow between the trochleae for the third and fourth toes. Brachypteraciidae are also known from the early Eocene of North America, where rollers do not occur today. Extant rollers are almost exclusively carnivorous and feed on invertebrates and small vertebrates. 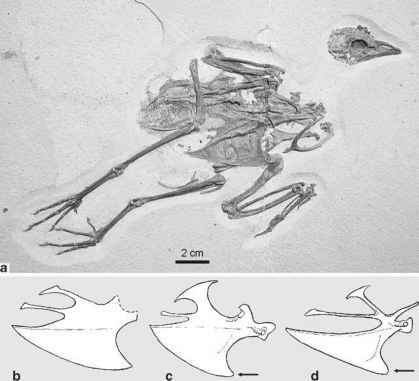 It is thus notable that in the two known specimens of Primobucco frugilegus (Primobucconidae) and in one specimen of Eocoracias brachyptera (Eocoraciidae) seeds are preserved as stomach content (Mayr and Mourer-Chauvire 2000; Mayr et al. 2004). This indicates that stem group representatives of rollers may have been more generalized feeders than their modern relatives (Mayr et al. 2004).